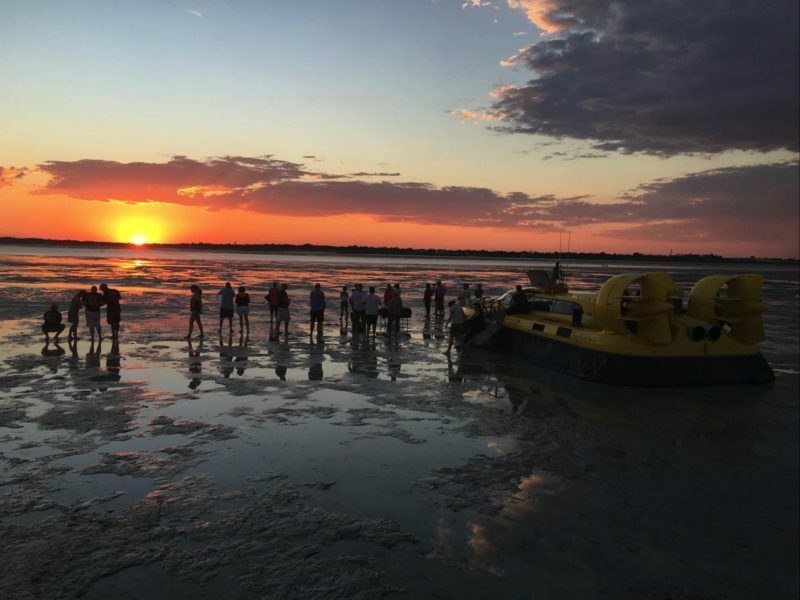 Broome Hovercraft currently operates hovercraft flights around the spectacular tidal reaches and mangrove habitats of Roebuck Bay. 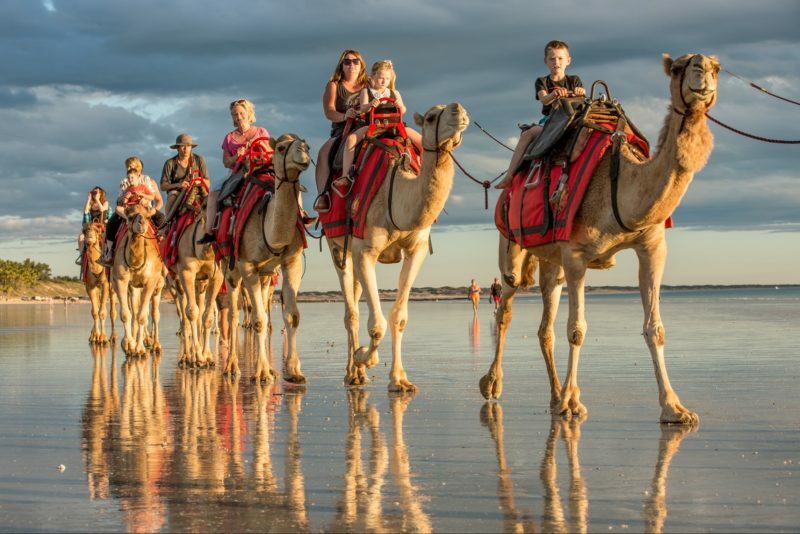 Operating out of the port precinct in Broome, overlooking the Deepwater Jetty and Roebuck Bay, they run up to six flights daily to experience a ride aboard one of the most adventurous types of transport, the Hovercraft. They access areas that cannot be reached by any other craft and take you to sights not visited by any other tour group. There are beautiful photographic opportunities along the route and many opportunities to see marine animals frolicking in the bay and flora and fauna along the coastline and up into the tidal creeks. This is a bird watchers paradise, with half a million water birds flying in from the far northern hemisphere. Their air-cushioned vehicles are the only commercial hovercraft operating within Australasia at this time. This one hour tour is the basis of all the hovercraft flights. The tour starts from the hovercraft base and glides amphibiously between the water and tidal flats, taking in some old fish traps, the site of the old Demco meatworks and the ensuing bayside real estate in its place. Roebuck Bay Caravan Park and Town Beach are the next points of call with the entrance to the old Broome Jetty next to the beach. 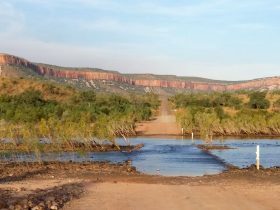 The World War Two Flying Boat Wrecks are spoken about as well as Buccaneer Rock and all of the interest in and around Dampier Creek. After skimming across the flats amongst the myriad wader birds, the craft lands at a remote beach where all alight to view some 120,000 million years old well preserved dinosaur footprints. 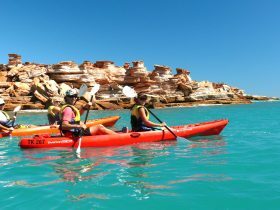 On the way back, there is much to talk about the tides, how they affect the pearling industry, and the Port of Broome. The tour starts from the hovercraft base and glides amphibiously between the water and tidal flats, taking in some old fish traps, the site of the Demco Meatworks and the ensuing bayside real estate in its place. Roebuck Bay Caravan Park and Town Beach are the next points of call with the entrance to the old Broome Jetty next to the beach. 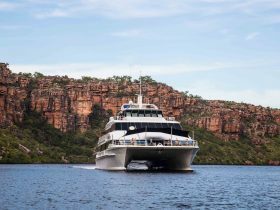 The World War Two Flying Boat Wrecks are spoken about as well as Buccaneer Rock and all of the interest in and around Dampier Creek. After skimming across the flats amongst the myriad wader birds, the craft lands at a remote beach where all alight to view some 120,000 million years old well-preserved dinosaur footprints. After leaving the beach the craft lands in the middle of the tidal flats and once more they alight to enjoy a delectable table of hors d’oeuvres and a glass of sparkling wine. Nature is mostly kind to them and provides a magnificent sunset with oftentimes, a clear staircase to the sun. On the way back across the bay, there is much to talk about the tides, how they affect the pearling industry, and the Port of Broome.